Exceptional image quality paired with an exceptional build quality are the hallmarks of the Zeiss 35mm f/1.4 Distagon T* ZE Lens. 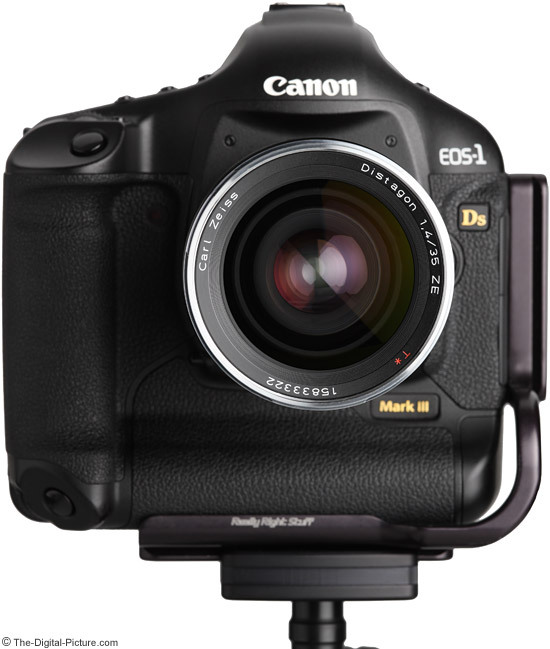 As of review time, the manual-focus-only ZE 35 f/1.4 ranks among the best 35mm Canon EOS-mount lens image quality available. And, like all of the rest of the Zeiss ZE Lenses, the ZE 35 f/1.4 is rock solid with an extremely smooth and long rotation focusing ring. Selecting a focal length that will work well for your application is always the important first step in choosing a lens. The moderately wide angle 35mm focal length lenses have a huge range of uses - especially when they have an ultra-wide f/1.4 aperture available as does this model. 35mm is wide enough to capture the big scene but not so wide that people are readily distorted. The 35mm focal length has long been a first-choice for photojournalists. Wedding photographers, who work in some of the worst lighting venues to be found, also frequently use 35mm f/1.4 lenses. Portrait photographers like the 35mm focal length for full to mid-body portraits and for group portraits. Landscape photographers have plenty of use for the 35mm focal length. Parents love 35mm f/1.4 lenses for capturing their indoor events. 35mm is also very popular with videographers. The list goes on and on. On an APS-C sensor format body, the Zeiss 35mm f/1.4 Distagon T* ZE Lens provides an angle of view similar to a 56mm lens on a full frame sensor format body. 56mm is close enough to 50mm to be used for all applications this extraordinarily popular "normal" focal length is used for - which includes many of the same uses as 35mm. Here is an example of what the 35mm focal length range looks like as well as reviewing the wide range of apertures available in this lens. The f/1.4 aperture is the widest available in a Canon-mount 35mm lens. Especially on a full frame sensor format body as exampled above, 35mm and an f/1.4 aperture can create a strongly blurred background. Ultra-wide aperture lenses such as the Zeiss 35mm f/1.4 Distagon T* ZE Lens are frequently not especially sharp at their widest apertures - especially in full frame corners. The ZE 35 f/1.4 is also not perfect at f/1.4, but it is easily one of the best-performing-at-f/1.4 lenses available - and the best-available 35mm f/1.4 lens. At f/1.4, ZE 35 f/1.4 images are quite usable with decent contrast. 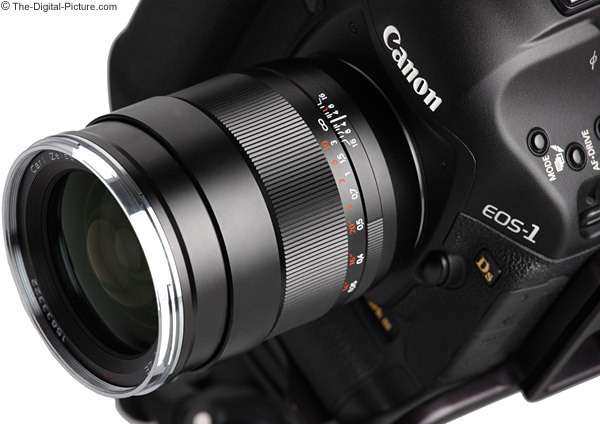 The ZE 35 f/1.4 has negligible field curvature - full frame corners are notably sharp at f/1.4. Stopping down the aperture yields increasing sharpness until the entire frame is razor sharp at f/4. Further aperture reduction yields little benefit in image sharpness. Another distinction of ultra-wide aperture wide angle lenses is a very noticeable amount of vignetting at their widest apertures. The ZE 35 f/1.4 does not vary from this norm. At f/1.4, full frame body users can expect over 3 stops of shading in the corners with an evenly decreasing amount of shading into the center of the frame. Strong vignetting is partly responsible for the characteristic "look" this lens delivers at f/1.4 - review the f/1.4 aperture example in the aperture comparison examples above to see the "look" I'm referring to. 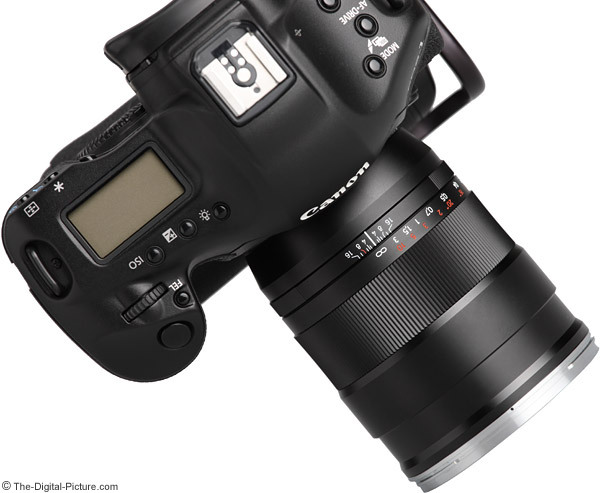 APS-C format sensor users will see a just-noticeable 1 stop of shading in the corners at f/1.4. The Zeiss ZE 35 f/1.4 does an excellent job at controlling CA (Chromatic Aberration) and coma. Distortion is also very well controlled with only a slight amount of barrel distortion visible in full frame images. The ZE 35mm f/1.4 avoids flare rather well, but is not completely flare free. The Zeiss 35mm f/1.4 Distagon T* ZE Lens has beautiful bokeh (background blur quality) and, again, can create a beautiful background blur when the subject is moderately close as seen in the aperture comparison earlier in the review. At review time, all Zeiss ZE Lenses are manual focus only. And, as craved for by the video industry, all Zeiss ZE lenses have best-in-class manual focus mechanisms. The ZE 35 f/1.4's focus ring is nicely sized, is incredibly smooth, has the perfect amount of resistance and has a long 148° rotation. 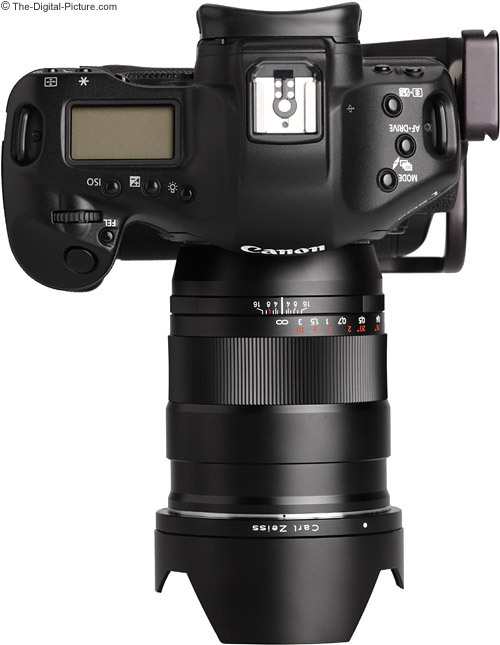 The ZE 35 f/1.4 extends very slightly (up to .06" / 1.6mm) during focusing. As you would expect from a lens of this quality, the filter threads do not rotate during focus adjustments. Focus distances in both ft and m are precisely engraved into the focus ring and detailed DOF (Depth of Field) markings are engraved into the lens barrel. Unlike most AF lenses and common to Zeiss ZE lenses is that infinity focus distance is a hard stop. Need to focus on infinity at night such as when shooting stars? Simply rotate the focus ring to its rotation stop. 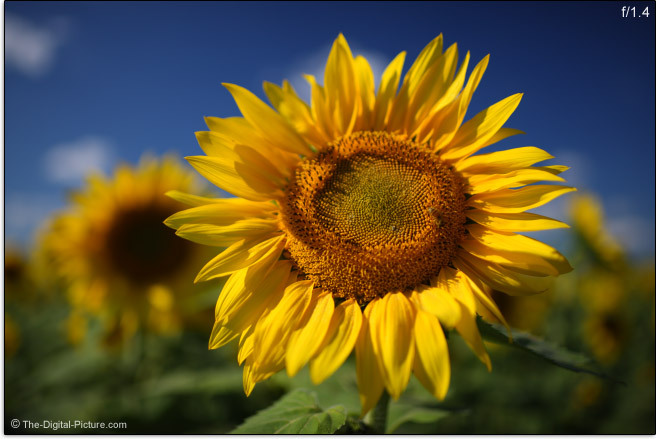 Shooting with a narrow aperture and need to capture a grab shot such as a wide landscape image? Simply rotate the focus ring until it stops. The Zeiss ZE 35 f/1.4 does not exhibit focus breathing - subjects in the frame do not change size as the focus distance is changed. Videographers find this attribute especially attractive. The Zeiss ZE 35 f/1.4 will light up the focus confirmation light in Canon EOS DSLRs, but I don't find this light to be accurate enough to be relied on with the shallow DOF available at f/1.4. A specialized focus screen will make accurate manual focusing of this lens via the viewfinder a much easier task. Live View at 10x is the ultimate manual focusing method for me. The Zeiss 35mm f/1.4 Distagon T* ZE Lens' minimum focusing distance is average for comparable 35mm prime lenses and provides a mediocre maximum magnification value. Note that the Canon EF 35mm f/1.4 L USM Lens shares the same MFD as the ZE 35 f/1.4, but the Zeiss has a slightly higher magnification value. 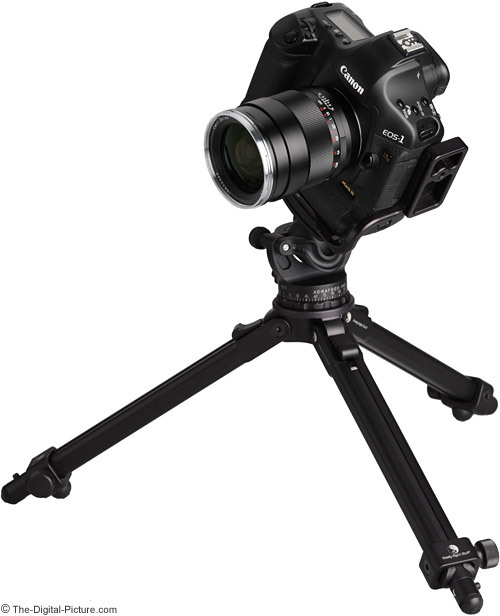 The Canon also showed a wider angle of view in the stationary-tripod comparison test shared later in the review. The ZE 35 f/1.4 is not compatible with extenders, but will show a significant increase in maximum magnification when used with extension tubes. 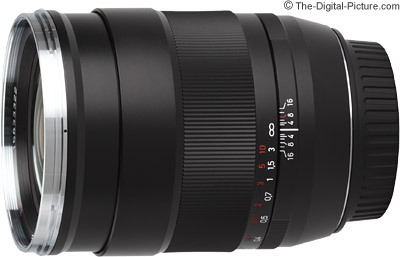 The Zeiss 35mm f/1.4 Distagon T* ZE Lens is an extremely solidly-built lens. Featuring all metal construction - including the focus ring grip - this lens has a cold, hard, rock solid, precision feel that few other non-Zeiss lenses provide. You immediately get the impression that your grandkids will be using this lens long after you are gone - even if you don't have kids of your own yet. It feels like it would last forever. There are no buttons, switches or any other moving exterior parts on this lens aside from the focus ring and the slightly-extending lens barrel (which itself is very solid). As of review time, there are no weather sealed Zeiss ZE lenses. 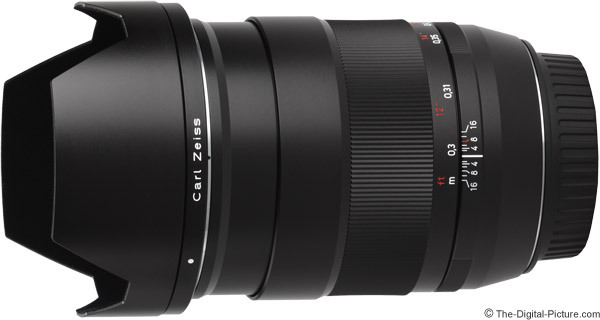 The Zeiss ZE 35 f/1.4 comes with a modestly-sized, high quality, petal-style metal hood. The inside of the hood is flocked for complete reflection avoidance. Retracted, the lens hood consumes little additional space. Note that lens hoods are not meant to be used retracted - they are worthless in this position. The downside to the narrow lens hood is that circular polarizer filters are hard to adjust inside of this hood. I was beside St Mary Lake in Glacier National Park shooting an incredible sunrise with two cameras. My exposures were 30 seconds (it was nearly dark out) as the sky began filling with amazing (but dim) color. Using two cameras setups was giving me twice as many shots at these long exposure durations - I could adjust one camera while the other was capturing an image. I installed the Zeiss 35mm f/1.4 Distagon T* ZE Lens on one of my cameras while the other was capturing an image. In the dark, I could not tell that I had the lens hood installed in the wrong rotational position. About 10 exposures later, I realized my error. Yes, with greater care, I could have prevented my mistake. But, with a slight change in design, the ZE 35 f/1.4 could have prevented me from making the mistake. I don't mean to make a big deal out of a small design flaw, but you do need to be aware of this issue (one that several Zeiss ZE Lenses share). The standard center-and-side-pinch Zeiss lens cap is easy to install/remove while the lens hood is mounted. The lens alignment mark is not visible with lens mount cap in place. This is not a big deal as you only need the alignment mark when mounting the lens - which requires the rear cap to be removed. However, my habit is to align the lens before removing the cap (slightly reducing the chance for dust to adhere to the rear element), so I am forced to create a different habit with this lens - thus I notice the hidden alignment mark. No lens case is provided with the Zeiss ZE 35 f/1.4. The Zeiss ZE 35 f/1.4 has 72mm filter threads. This is a size shared by many other lenses - which means that the potential for sharing filters is high. The Zeiss 35mm f/1.4 Distagon T* ZE Lens' excellent build quality comes at the expense of a high weight rating - weighing nearly 50% more than the Canon EF 35mm f/1.4 L USM Lens. For many more comparisons, review the complete Zeiss 35mm f/1.4 Distagon T* ZE Lens Specifications using the site's Lens Spec tool. Compared to all lenses, a 29.7 oz (840g) lens is not a heavy weight lens - nor is it uncomfortable to shoot with. On the contrary, I really like the size and weight of the Zeiss 35mm f/1.4 Distagon T* ZE Lens. But if you are carrying a pack full of Zeiss ZE lenses, you are going to feel the impact of their above-average weights. The Zeiss ZE 35 f/1.4 is also largest in class - but the difference in size between it and the Canon 35 f/1.4 is not that significant. Below, a subset of the above lenses are shown larger. Click on the image below to see an image quality comparison between the Zeiss 35 f/1.4 and 3 other 35mm lenses. 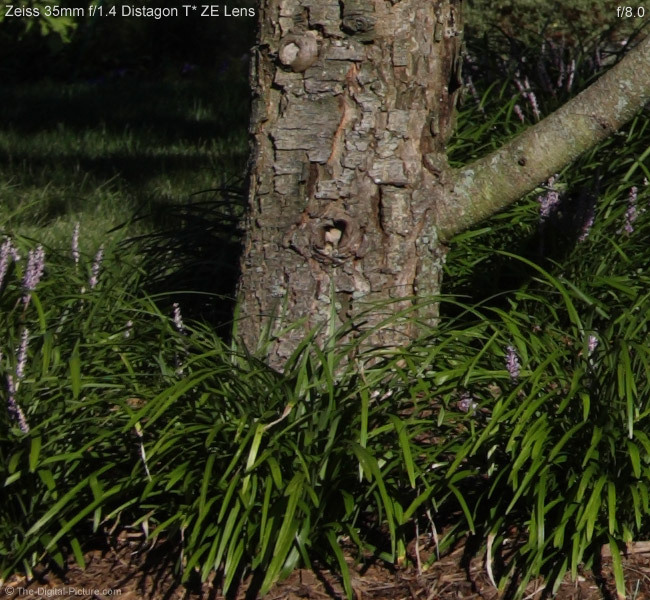 At f/1.4, shallow DOF is apparent - look at the tree trunk for this comparison. At this ultra-wide aperture, the Zeiss 35 f/1.4 shows better sharpness/contrast at this location in the frame than the Canon 35 f/1.4 does. It also shows an advantage across the entire frame. At f/2, the other pair of lenses join the comparison. The Zeiss 35 f/2 and Canon 35 f/2 both show their wide open aperture vignetting, but the Zeiss 35 f/1.4 is the clear winner again at this aperture - and again wins across the entire frame. And the Canon 35 f/2 is, as expected, the clear loser. I give the Canon 35 f/1.4 the edge over the Zeiss 35 f/2 at f/2 - and the Canon is the clear winner in the center of the frame comparison between these two lenses at f/2. At f/2.8, the Zeiss 35 f/1.4 retains the advantage in the corners, but the Canon 35 f/1.4 eliminates most of the gap across the frame. - and gains more of an advantage over the Zeiss 35 f/2 in the corners. The Zeiss 35 f/2 performs similar to the Canon 35 f/1.4 in the center of the frame. At f/4 and narrower apertures, the Zeiss 35 f/1.4 continues to retain the advantage in the corners, but the overall advantage over the Canon 35 f/1.4 is minimal. The Zeiss 35mm f/2 continues to trail the Canon 35 f/1.4 in the corners out to f/8 or so, when the two are both impressive. The Zeiss 35 f/2 continues to perform similar to the Canon 35 f/1.4 in the center of the frame. At f/16, the effects of diffraction become obvious with results for all lenses becoming less sharp. 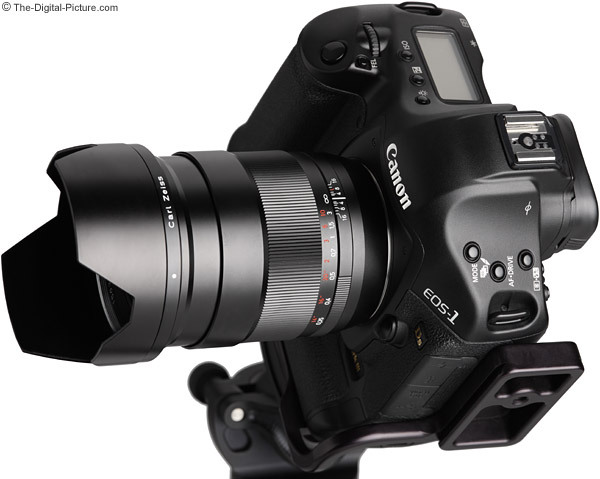 The big Canon advantage over Zeiss is autofocus. If you need the best autofocus 35mm lens with an aperture wider than f/2.8, the decision at this time is easy - get the Canon EF 35mm f/1.4 L USM Lens. I slightly prefer the flare characteristic of the Canon 35 f/1.4 to the Zeiss 35 f/1.4. The Zeiss 35 f/2 performs very similarly to the Canon 35 f/1.4 in this regard. The Zeiss 35 f/1.4 is the heaviest of the three high end 35mm lenses. It is also the most expensive. The Canon 35 f/1.4 falls into second place in the expense category and the Zeiss 35 f/2 follows in third place. 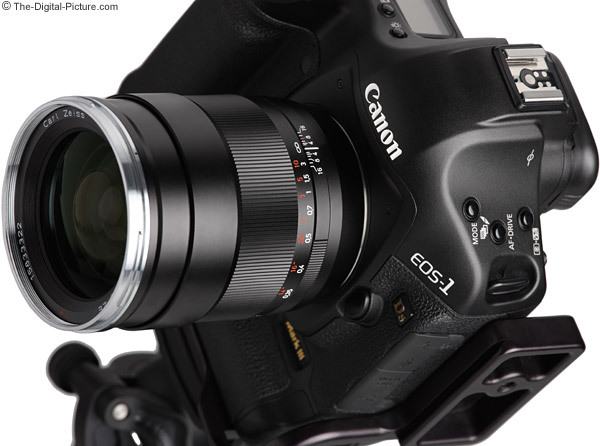 The Zeiss 35mm f/1.4 Distagon T* ZE Lens is available in Canon (reviewed) and Nikon (ZF.2) mounts. If manual focus only is not a drawback for you, I highly recommend the Zeiss 35mm f/1.4 Distagon T* ZE Lens for your 35mm needs. The price of this lens is going to keep this lens out of casual photographer's kits, but this incredibly-well-designed and -built lens delivers the impressive image quality serious and professional photographers are looking for.